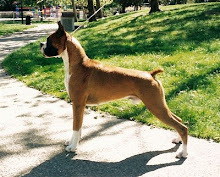 Bishop's Boxers: Puppies Are On Their Way! One indicator of the timeline for whelping is the dam's temperature. Once it drops to about 98 degrees, we know that puppies will be here in about 24 hours (give or take). Late tonight, she started panting and her temperature dropped. Puppies are coming soon! Stay tuned for updates.